While President Barack Obama called on the Senate to compromise and extend key provisions of the Patriot Act in order to reform America’s surveillance capabilities, Sen. Rand Paul said Obama was being “disingenuous” and could end the program himself. In five days, key provisions of the Patriot Act will sunset, including one that the National Security Agency’s has used to justify its ability to search Americans’ phone records. 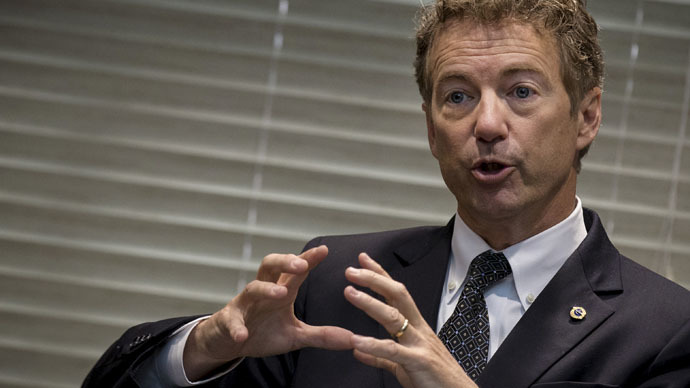 Sen. Paul, a Kentucky Republican, said that because much of the NSA’s sweeping authority was cemented under an executive order, Obama could act alone to repeal the agency’s power. Paul, also a 2016 presidential candidate, was responding to President Obama’s call for the Senate to find a way to extend the soon-expiring Patriot Act provisions. "This needs to get done," Obama told reporters in the Oval Office on Tuesday. "It's necessary to keep the American people safe and secure." While the executive order giving the NSA broad spying authority was implemented in 1981 under President Ronald Reagan, the agency only began bulk collecting American’s phone records during the George W. Bush administration, via Section 215 of the Patriot Act. In 2011, Obama reauthorized certain provisions in the law. However, former National Security Agency contractor Edward Snowden exposed the agency’s controversial metadata program in 2013, which led Obama to say last year he would curb some aspects of the NSA’s authority. He supported passage of the USA Freedom Act, which would have ended the NSA’s bulk collection of telephone data and reformed the way it accessed such information, but the measure failed in the Senate over the weekend. Paul, who against renewing the Patriot Act without addressing concerns over surveillance, thinks the data collected by the NSA under its bulk telephone collection program should be deleted. White House press secretary Josh Earnest told reporters Tuesday afternoon that Obama could not unilaterally end the telephone bulk collection program. “The authorities that are used by our national security professionals to keep us safe are authorities that are given to those national security professionals by the Congress, and those authorities can only be renewed by the United States Congress through an act of Congress,” said Earnest. The Senate failed to pass the USA Freedom Act early Saturday before adjourning for the Memorial Day break, despite the bill finding easy passage in the House of Representatives. The House and Senate are in recess for the week, and a House GOP leadership aide who spoke on the condition of anonymity told the Associated Press there were no talks happening between the two chambers. Senate Majority Leader Mitch McConnell (R-Ky.) is calling the Senate back into session on Sunday, May 31 – just hours before the midnight deadline – but it's not clear lawmakers will have any new solution. McConnell complained that the House bill waters down the bulk collection program that now exists, but acknowledged that "they passed it by a very large margin. So that makes it pretty challenging to extend the law as it is." The House bill does away with the NSA program over six months but gives phone companies the responsibility of maintaining phone records that the government can search. The legislation also includes tools used by the FBI that make it easier to track “lone wolf” terrorism suspects with no connections to foreign powers. Another provision allows the government to eavesdrop on suspects who continuously discard their mobile devices.